It will with luck explain about his wife, Martha, the city of Ironton, the serial killer, Charlie Adams, and Frank. Frank Nagler slipped the blue jacket over his shoulders, and with a shimmy, pulled at the lapels to square it up. It was Martha’s idea that he needed new clothes for his new job. He would have been happy just to wear his comfortable brown jacket, even if the elbows were shiny, but she insisted. At least he had his old, worn-in shoes. She had dragged him to Benny’s Menswear where for an hour she had him model suits and jackets and pants, smiling at his reluctant effort as the selected and rejected clothing piled up on a display case and nearby chair. “I’ll not have my detective go to work on his first day looking like a sad sack insurance salesman,” she whispered in the store while she draped one more new tie around his neck. He gazed at himself in the bedroom mirror again, tipping his head from side to side. Okay, not bad. When he tried to put his hands in the side pockets, he laughed. He side-stepped into the family room from the bedroom, looking for his wife of two years. This house had too many doors, he thought. “I have a seam ripper,” she said seductively, stepping from behind the kitchen door leading to the living room and slipping her shoulder out of the over-sized t-shirt neck and winking. She spun out of the kitchen into the pantry, opened a cabinet drawer and removed a sewing box. “That’s not all you have,” Nagler said, as he reached around her waist when she returned and kissed her neck. “Oh, how true,” she said as she kissed him, while displaying a small instrument with a plastic handle and a short, curved metal blade. “Watch it,” she laughed, leaning in. “I could swoon and accidently trim your nose hair.” She comically rolled her eyes as her red hair glistened with scarlet highlights in the morning sunlight. Her hair was her singular vanity, Nagler knew. Long and thick, it cascaded off her shoulders to her waist. She wore it loose, and teasingly buried her face in it when they loved; let him part it and discover her bare shoulders and breasts; he would bury his face in it to draw in the scent of her. So much better than those months when as a teen-ager the cancer and the chemotherapy stripped her hair of its color, the days of despair and loathing when she chopped it off, and nearly bald, wrapped her head in a black scarf while she had tried to hide from the world what her pale, thin face announced. She pulled off his jacket, laid it on the kitchen table, cut way the stitches and opened the pockets. She smoothed the fabric. Martha hugged him tighter and then buried her head into his chest. “The forces of evil are many, my love. Battle well,” she laughed. “Where did you get that?” he asked with a surprised, wrinkled smile. She buried her head into the crook of his shoulder, slivers of tears caught in her eyes. “No more,” she said as she wiped her eyes and turned her sad smiling face upward. “I’ve already worn black for another reason. I’m not ready to do it again. Just make sure you come home,” she fiercely whispered. In the driveway, Nagler slipped behind the wheel of the ten-year-old gray Impala he’d been assigned and listened as the suspension groaned when he sat. He glanced at the speedometer: 115,312 miles. Hard miles of slamming and grinding on Ironton, New Jersey’s pitted, pot-holed streets; a mile of downtown had been finally repaved after century-old trolley tracks resurfaced and the mayor’s new silver Caddy bottomed out making a left turn. The day’s heat had already set in, even before the sunlight dusted the hilltops east of Ironton; he knew the new blue jacket would spend the day draped over the passenger’s side seat, his sleeves would be rolled to his elbows and the tie wrenched to one side. Nagler had listened as a radio weatherman happily babbled on about Bermuda Highs, the jet stream this, the jet stream that, all of which was unusual for the Northeast in mid-May. It’s like August, the weatherman exclaimed, with too much cheer, Nagler thought. Nagler paused the hulking car at the end of the driveway and waved to Martha framed by a second-story window and then exhaled deeply. “What was all that about?” he asked, slightly shaking his head so she might not see it through the window and at that distance. He waved again and smiled up at her, still in the window. He knew her routine: A quick shower, an eye-rolling, Yes, Mom, I know, Mom, conversation about grandchildren with her mother – Frank and Martha lived in the upstairs apartment above her parents in her childhood home – and then off to work teaching English and reading to preschoolers; maybe coffee at Barry’s diner at the end of her day. Sometimes Italian at Marco’s. The car’s police radio barked to life and dispatcher Mattie Washington called out his name. The Baker Hills section of Ironton was developed more than a century ago as a swanky neighborhood by one of the city’s rich bankers for the business owners and managers of the iron industry. The soft, greenlined roads featured large, fancy homes with turrets and wrap-around porches, landscaped, fenced yards, some with small gazebos, a few with wrought-iron gates across their stone driveways. The neighborhood was on the west side of the city, set on rising hills planted with fragrant flowering trees and a wall of tall Norway maples that blocked the view across the river of the black, belching mills and the workers ghetto where soot rained down like Hell’s mist. In truth, he had grown up believing, rather, having to believe, that nothing bad ever happened in Ironton, his hometown, at least nothing that could not be overcome. It’s what you do in a poor town, he learned. The floods, the factory closings, the homeless living under the bridge, the permanent bend of his father’s back after work, then the thousand-yard stare when the mills closed. Somehow Ironton survived, got up from the knock-down and trudged on, the limp a little more pronounced, the tear stains a little deeper on the dirty faces of hungry kids. He grew up believing that things would always be better. Martha Shannon, his true love since the third grade, was proof enough of that: She hadn’t lived in the workers’ ghetto; she had led him out of it. He had grown up on Fourth Street, a block over from Third, and two blocks from Sixth. They weren’t street names, just lines on a map — Street One, Street Two, Street Three – designations created because some city engineer had needed a way to make sense of the tangled mass of alleys, odd-sized lots and trails, nothing more. What lived beyond the engineer’s solution were the informal names of alleys that reflected the immigrants, the Germans, Italians, Irish, Poles — the whatevers — who, despite hard lives, filled the tiny homes with generations, spilled over the hillsides brawling and battling with life, dancing, joyously laughing and singing, trying to stand, then to be knocked down again, wishing the rays of sunlight were not so gray, and that the air didn’t taste like ash. Nagler slipped off the state highway into Baker Hills and left the bright clutter of commerce behind; like a gate silence descended and deepened as he drove along the shaded, darkening streets where the morning sunlight had yet to penetrate; a sterile silence, sound absorbed by sentinel homes, by the dense leafy overhang, more a setting, a stage, than a place. Nagler maneuvered the Impala cautiously over the scattered speed humps, as if unneeded speed would disturb the unnerving peace. There is quiet, he thought as he searched for the turn to West Harvard. There is quiet with movement and light. Then there is too quiet; this. 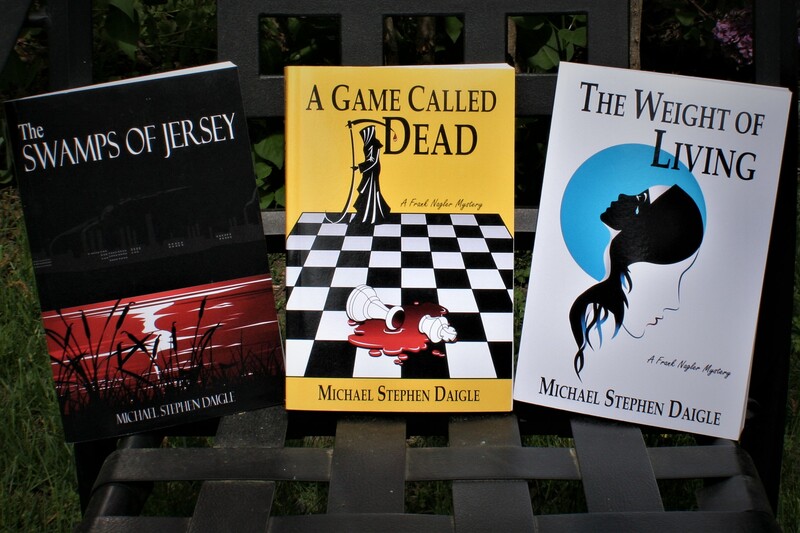 This entry was posted in BooksNJ2017, Fiction, Greater Lehigh Valley Writer's Group, Hot in Hunterdon; Georjean Trinkle, Imzadi Publishing LLC, Michael Stephen Daigle, Mystery Writers of America, www.michaelstephendaigle.com and tagged "A Game Called Dead", "Just Come Home", "The Swamps of Jersey" Imzadi Publishing, "The Weight of Living", Fiction, Frank Nagler, Ironton, Morris County. Bookmark the permalink. A new Frank Nagler mystery is heading your way!